Broken strings are a nuisance that most players of stringed instruments have faced. After the fact, you often want to determine why the string broke. Was it a fluke? A bad string? Or maybe your playing style is harsh on strings. 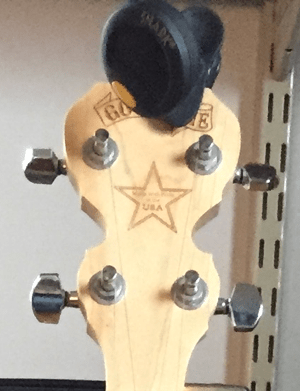 A good place to start is to make sure there was nothing about your instrument that caused the string to break such as a sharp burr on a tuning post. I recently put an Aquila Red set of strings on my Goodtime banjo. The first string broke while the banjo sat on a stand across the room from me. I witnessed the string breaking. This isn’t the first time I’ve seen Aquila Red strings break. I’ve twice seen them break on ukuleles where I’ve had a Aquila Red for Low G tuning. The first place on the banjo one might suspect for the cause of a broken string is the tailpiece (seen on left). The No-Knot design as made today is known to often have sharp edges and burrs that can cut nylon strings. I had polished all sharp edges where the string might contact the tailpiece by using emery cloth before I installed the strings. The string did not break at the No Knot Tailpiece. The other obvious place for metal to cut nylon strings are the tuning machines. The post holes are designed for steel strings and it wouldn’t take much of a sharp edge or burr to cut a nylon string. Poor quality or finished tuning machines can even cause steel strings to break. The pic to the right shows steel strings on my banjo before I changed to the Aquila Reds. The important observation regarding this string break is that it didn’t happen at the tuning posts. 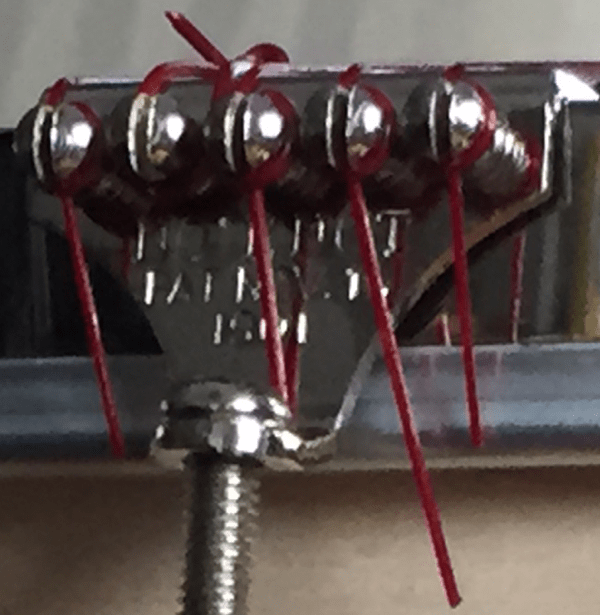 The bridge and nut are two other places where strings can get caught up, wear and break. But lets get to the point. The string did not break at either of those places either. Here are a couple of pics of the break. Notice that break looks to be somewhere between the first and second fret. It doesn’t seem to be near any metal unless the second fret is responsible. Although the images here might not show it well, my examination of the second fret found it to be smooth without burrs — as were all the frets. The first purpose of all this post mortem analysis as to the causes of the broken string are to eliminate all the usual suspects — i.e., the sharp areas on your instrument. But the second reason for this is to highlight that Aquila Red strings seem to have a problem with breaking that other strings don’t. After my first Aquila Red string broke on one of my ukuleles I wrote the company and got a nice reply and a free replacement string. Still, not unexpectedly, it was suggested that my instrument was responsible, and not his company’s strings. However, all of the Aquila Red string breaks I’ve had have been in the middle of the fretboard, not at on the the suspected areas of the instrument. I’ve seen the strings break before my eyes. Do you remember rolling dough or clay as a child. If you rolled a long, thin, round snake (like a thick string) and pulled, you could watch the strand thin in the middle until it broke. That’s what appears to be happening to these strings and it appears to be happening spontaneously. 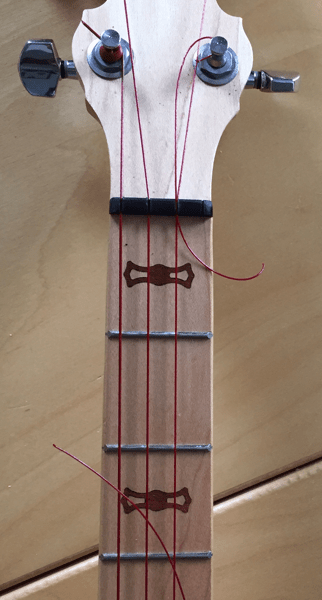 I have had one Aquila Red string on a tenor ukulele for more than a year and it has shown no signs of breaking. But every other time I’ve used these strings I’ve gotten a break with the first two or three months. The frustrating thing is I love these strings. They sound great. They allow you to have a set of banjo or ukulele strings without wound low strings. I want these to work. But I am giving up on the Reds for now. I currently have gone back to steel strings on the banjo. I’ve gone to Worth strings on one of my ukuleles. I hope the ukulele with the Aquila Red low G doesn’t break. I still love Aquila’s products. I’ve got Aquila strings on my Yamaha classical guitar. The next strings I try on the banjo will probably be Aquila all plain nylgut. However, I wish Aquila could fix the breaking problem of their Red series strings. The problem is with the string manufacturing process or design and based on my experience affects many but not all of their Red strings. Hell I wish I had this before I ordered / shipped four sets for with banjos. Shipping from US to Thailand cost 56 USD.all up 114.8 USD Two of my banjos are using nylon LaBella with no problems. For my third banjo I am going back to guitar nylon or fishing line with steel on the 5th string. 5th string peg is a geared Walvey which will not take nylon.